During a promotional event, organized by Mercedes Benz, which took place recently, Vikram was spotted with Formula 1 car racer Lewis Hamilton. The actor landed at the venue by a chartered helicopter to participate in this event. 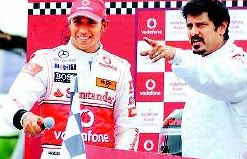 Speaking at the occasion, Hamilton said that he is keen on participating in the Indian Grand Prix. All the cars in which Hamilton performed some breathtaking stunts were supplied by the main sponsors, Mercedes Benz. Vodafone was the co-sponsors of this event, which lasted half a day.